Urban bar SuWu is an idyllic hipster hideaway, one that is bringing the concept of “soul food” back to the St. Laurent strip. Flanked on both sides by glitzy, high-profile bars and nightclubs that are signature to The Main, SuWu is almost imperceptible to pedestrians. Its interior, while significantly more relaxed than its bass-pumping counterparts, is no less remarkable. Mason jar lights hang from the ceiling, repurposed barn wood and shelves of flea market antiques line the walls, and the bar even boasts the head of a carousel horse. The eye doesn’t know where to settle since every glance reveals something new. When the place is in full-swing, the stereo pumps out mellow hip-hop beats into the warmly-lit venue, giving it a Brooklyn feel in a central 514 location. 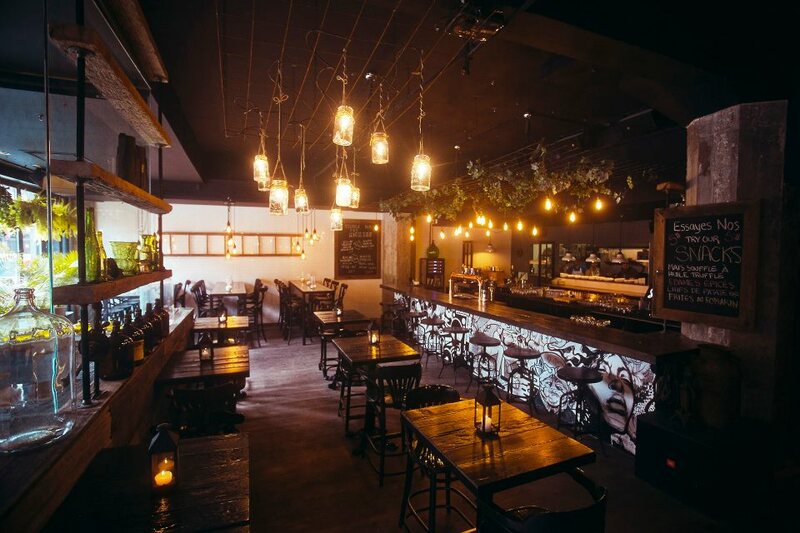 The love child of young entrepreneurs, it boasts a painstakingly compiled menu and wine list. SuWu’s plates are served up tapas-style: small servings at reasonable prices, so that groups of friends can sample many of the decadent offerings at once. Some all-stars include their truffle oil popcorn, buttermilk fried chicken (interestingly served with french toast and blueberry coulis) salmon tartare, and mini lobster rolls. Their main draw, however, is the grilled mac ‘n’ cheese. The idea sounds completely gluttonous and “all American,” but no words can really capture how savoury their creamy, herbed mac ‘n’ cheese is when grilled between two buttery slices of country bread and served with a spicy marinara sauce for dipping. The idea is not new, but it is a risky dish that Montrealers haven’t quite seen since the creation of poutine. With chefs constantly experimenting behind the scenes, the menu changes from time to time, but the new additions are always exciting. Paired with a “signature” drink like the “Big Booty Ho” — a mixture of pineapple juice and banana liqueur — or a draft beer, the selection is always satisfying, and never overwhelming. SuWu is also open for brunch on the weekends, and offers mimosas as a side. The overall atmosphere is welcoming and laid back. The emphasis on quality food and quality service is refreshing in a neighbourhood of “bottle service only” and music so loud that conversation becomes obsolete. At SuWu, it feels as though you are in a place that’s been standing since the turn of the century, among the oldest of friends. Which is a resoundingly good feeling, since friends will not judge you for ordering seconds. Bar is located at 3581 St. Laurent, corner Prince Arthur.